U.S. stocks closed positive on Friday, while trade will likely remain the primary focus over the coming sessions as investors diverted their attention to the second-quarter earnings season. Dow was up 94 points and reclaimed its break above the 25,000 level, driven by signs of economic strength and solid quarterly earnings and the negotiations to ease tensions on trade war. 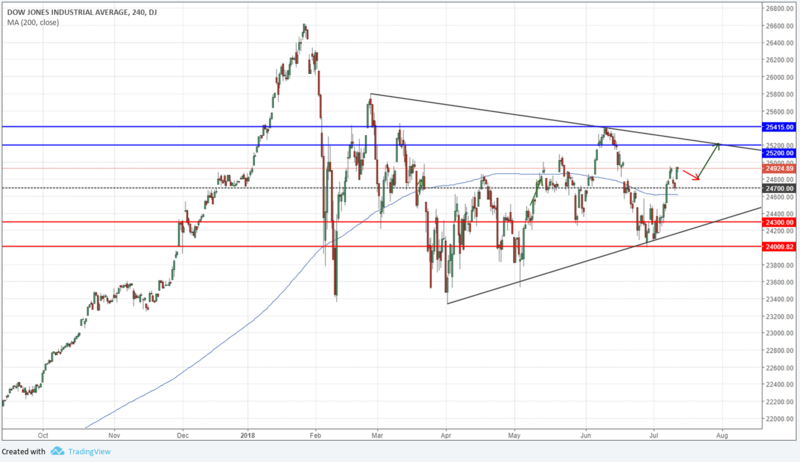 The Dow Jones Index closed slightly above the 25000 level, while still trading in a triangle chart pattern. More upside is likely once price breaks above the triangle pattern. A bullish breakout above the resistance trend line at 25200 would confirm a potential uptrend continuation. A break below the support 24700 however would indicate a bearish reversal or extended correction. Volatility remains a concern and the index has been very choppy recently.